Universal Cinemas, a venture of Nishat Chunian Group, opened 11 screens in its first year of operation. The first two cinemas are located in Multan at The Grand and in Lahore at the world class Emporium Mall. Both locations are multiplex cinemas striving to revolutionize the cinema going experience in the country. Our Lahore location is currently our flagship cinema with 2 VIP halls and a VIP seating lounge, 7 halls with premium seating, 7 concession counters and 3 cafes. It has a seating capacity of above 1800. This 9 screen multiplex is currently the largest in Pakistan with up to 45 shows a day! Universal Cinema’s has been established on the values of Innovation, Credibility, Convenience and Excellent Customer Service. 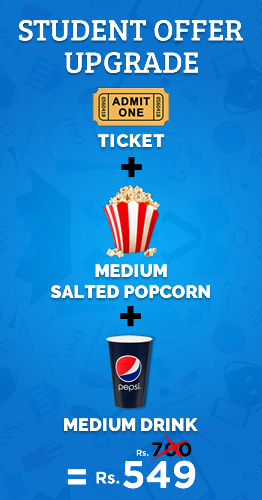 We aim to bring novelty in all aspects of our cinemas by using the most cutting edge technology and offering the most unique services to our customers. Our cinemas feature state of the art Dolby ATMOS audio processing system, high resolution 4K digital projection systems, immersive digital 3D content and expansive universal ULTRA screens. Our loyalty program is the first of its kind in the country and will ensure that we are able to build long standing relationships with our customers. We strive to provide customers with convenience in the way tickets are booked and purchased. For that purpose in addition to the Box-Office counters, customers will be able to get their tickets via this website, Home delivery service, touch-screen self-service kiosks or through Universal Cinema Mobile apps. Upholding our credibility is one of our top most priorities. As Universal Cinemas is affiliated with the prestigious Nishat Chunian Group we have a strong reputation of ethical business to live up to and we intend to do just that. The foremost priority for us is delivering the best customer service. The pinnacle of Universal Cinemas will be the extraordinary degree of customer orientation. Through these values we aim to make Universal Cinemas the ultimate destination for moviegoers in Pakistan.